I guess our eggs are not very Easter-y are they? They’re basically just eggs masquerading as all my favorite things! Balloons and donuts and gum, oh my! 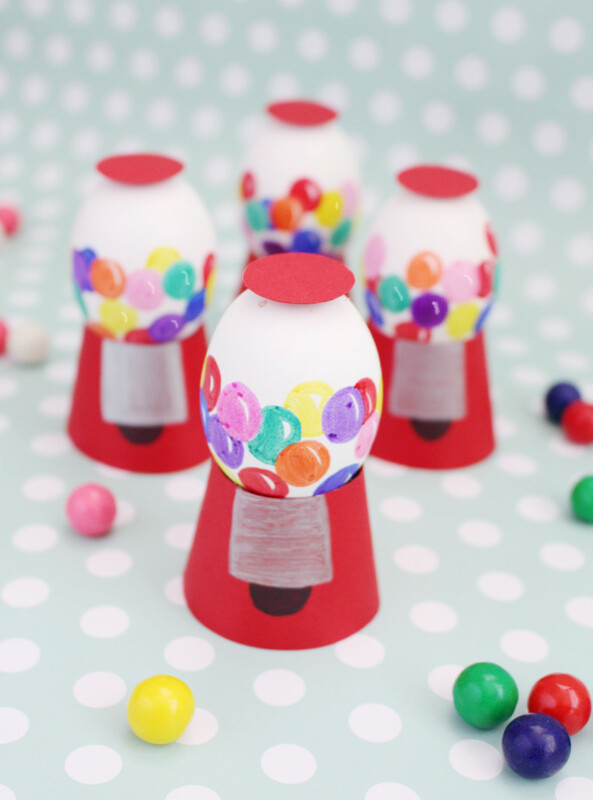 Seriously though, I had too much fun creating these bright and colorful eggs this year! 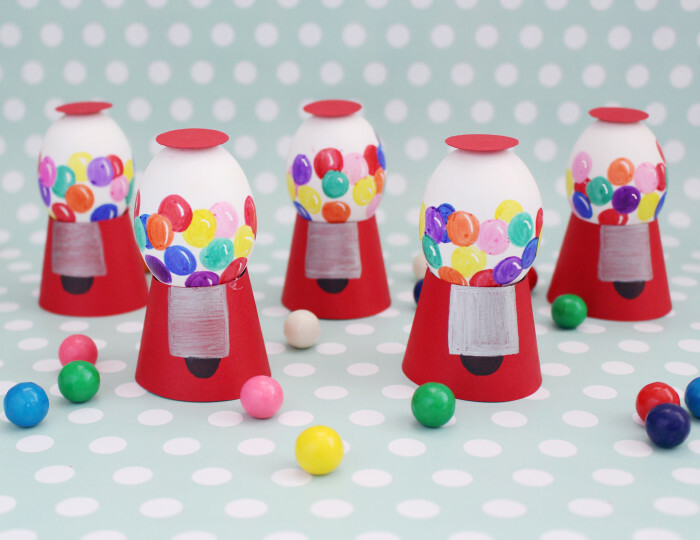 And I LOVE bubble gum, always have, so I think I’m kind of partial to these gum ball machine ones. 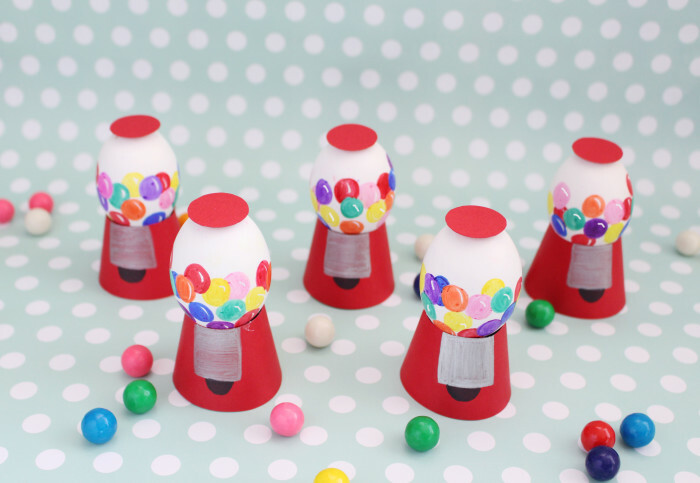 Plus they’re perfect for so many birthday party themes so they’re not just appropriate for Easter. That’s what I call a win! 1. Gather your eggs. 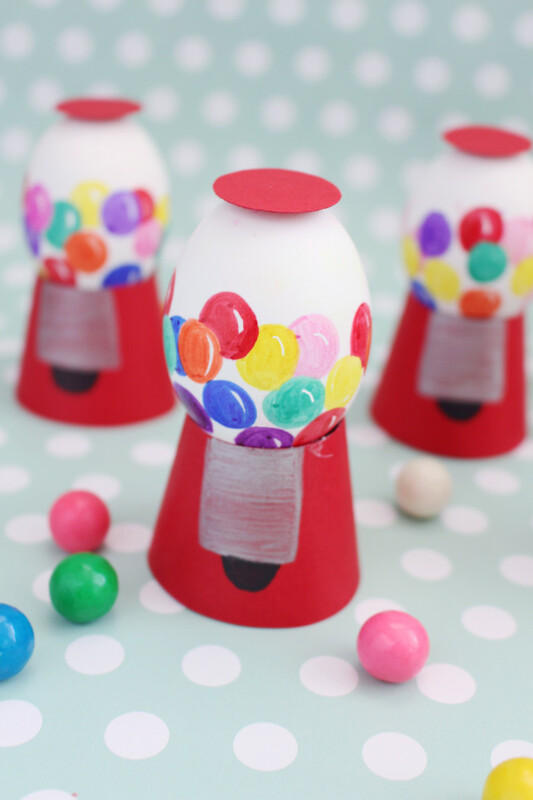 I used Blown out ones because I had some I never used for anything but hard boiled would work great. 2. 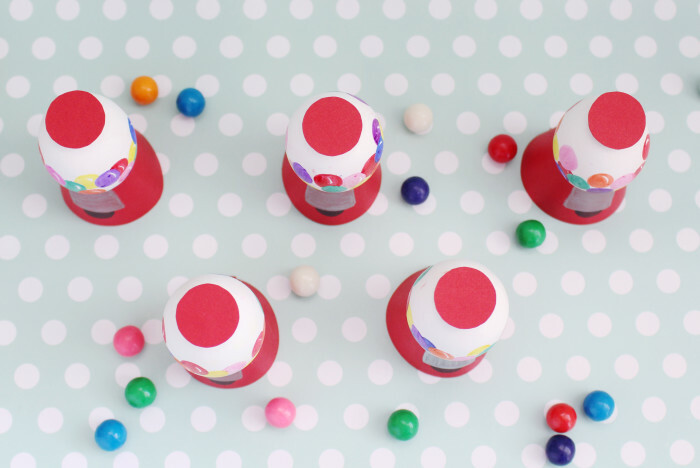 Draw little circles with multiple colors of permanent markers. 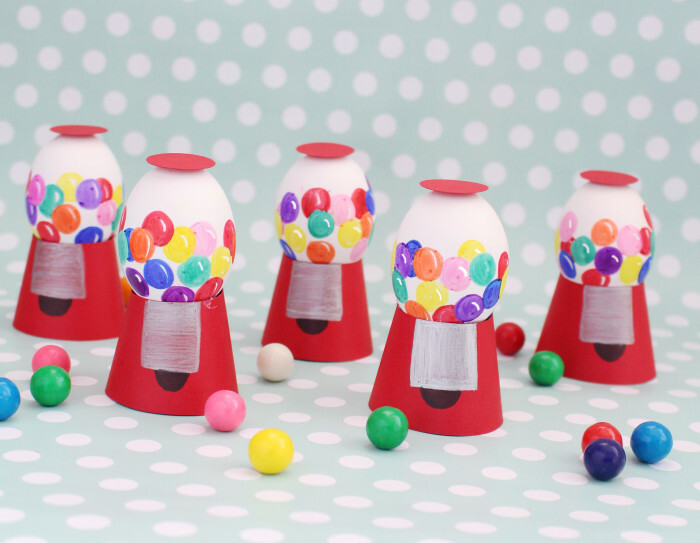 Leave a little sliver of white showing to make them look more like bubble gum spheres! 3. Continue to add colors of bubbles. 4. Cut out the template for the bottoms and the tops. If you don’t have red paper or the silver and black markers, I’ve created a template here that has that all added for you to just print on white card stock. 6. If you’re not using the printed template, draw on silver squares and black half circles to look like the front of a gumball machine. 7. Apply some glue to the inside rim of the cones. 9. 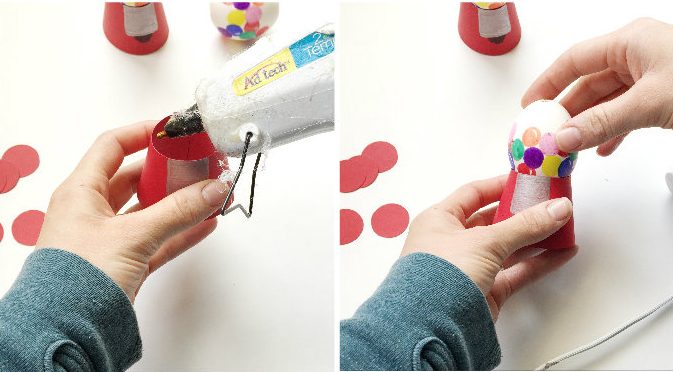 Attach the little circles to the top of your eggs and you’re all done! I love that I used blown out eggs because I can keep these right out on my counter where I can see them and be happy all the time! 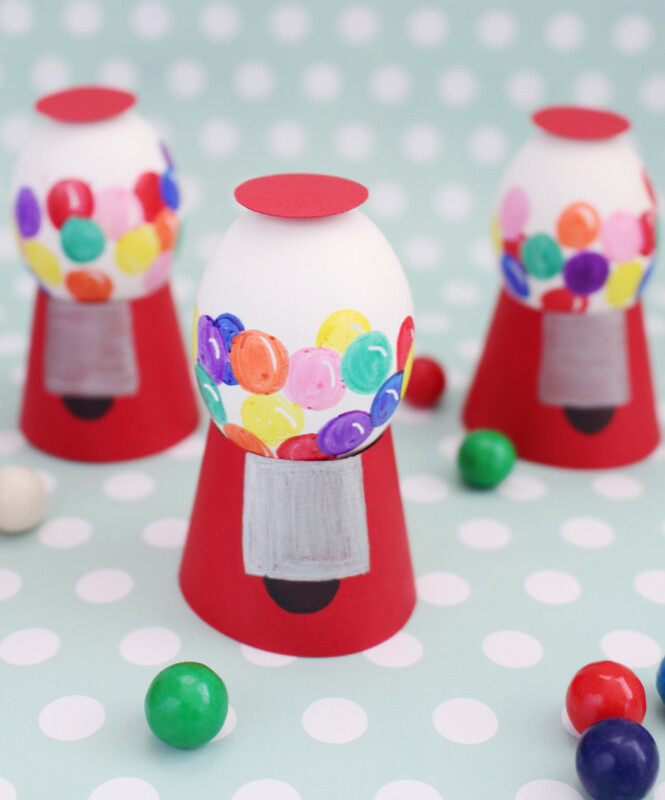 But I can only imagine how delighted guests would be to see real eggs disguised as mini little gumball machines! Oh my gosh thank you Jamie!! just when i thought my 14 year old was too old to dye eggs, you’ve come up with a project she’ll love! thank you soooo much for sharing your fabulous idea!